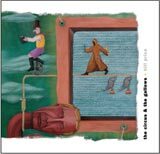 The Circus & The Gallows is a CD single with three original songs. Most of the recording was done in one big session on March 26, 2003. With exception of vocals and a couple of small parts, the recording was done live with all the musicians playing together. Released October, 2007.